DreamSky Decent Alarm Clock Radio FM Radio USB Port Charging is currently selling at $24.99, which is its normal price. It has a lowest price of $24.99 and is selling within its usual range. Price volatility is 0.15% (meaning it does not change often), so you might have to wait a while for the price to drop. Until then this is a recommended 'ok deal'. There is a coupon available for an additional 15% off. The current deal is also the best price on this item over the last month. 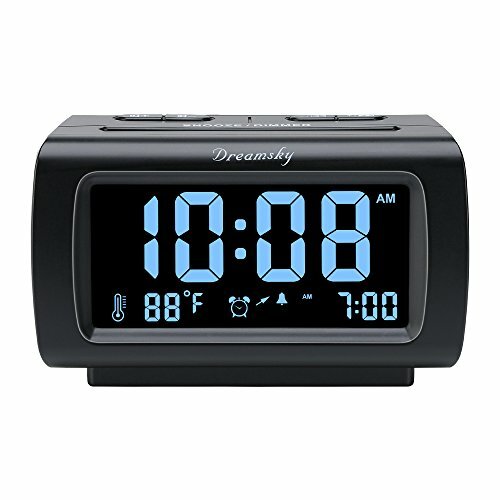 Compare the current price, savings (in dollars & percent) and Buy Ratings for the top Alarm Clocks that are closely related to DreamSky Decent Alarm Clock Radio FM Radio USB Port Charging. Here is how DreamSky Decent Alarm Clock Radio FM Radio USB Port Charging compares with other leading Alarm Clocks. Decent Alarm Clock with Large, Clear Display Clearly view the time on the large and clear LCD screen with nice blue illuminated jumbo digit . No squinting to read the time, even without your glass . Decent look, clean, simple, aesthetically pleasing design. Not too big, not too small, décor even as additional decoration . Adjustable Brightness Control With the dimmer button , you are able to adjust the brightness to high or low for comfort view, or turn the brightness completely off for night sleep. No light, no complain, clock is still running . Have a good rest ! Enjoy FM Radios Single on/off radio button, tuning in your favorite channel with 0-15 level volume adjustment . Built in high quality loudspeaker, the sound is loud and clear , enhance your listen experience . Programmable Sleep Timer Fall asleep to the radio using the programmable count down sleep timer. 10-120 minutes optional. Gradual Alarm with Adjustable Volume The gradual wake alarm feature starts with a subtle, low volume and then gradually increases to a reasonably high level in order to gently wake you up from sleep. Alarms sound can be adjusted to your desired level whatever select wake up to buzzer or radio . Buzzer with 3 level adjustment (high, medium, low). Radio with 1-15 level adjustment. Snooze Button Snooze function will let you catch an extra shuteye . 9 minutes interval to mute the sound for every click button , which can be repeated to one hour until turned off . USB Charging Port The labelled “ out “ USB port for other smart device charging like cellphone, tablet etc. Very handy and convenient. Battery Backup An optional backup battery keeps the clock working during a power outage . 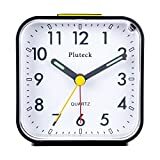 FeaturesElegant Digital Alarm Clock with Dimmer: 4 Inches large LCD screen with eye easy catch blue number display , time and content are easy to read at a glance . 3 level (high/low/off ) adjustable display brightness for comfortable viewing . 12 or 24hr switch, Indoor temperature ( ? or ?) Display.Digital FM Radio with Sleep Timer: Easy tuning in FM radio channel with 0-15 level volume adjustable. Speaker is loud and clear. Benefit sleep timer function lets you fall sleep to the radio by preset the radio to play for a certain amount time (10-120 minutes optional).USB Charging Port: Extra USB port allow you to charge your smartphone, ipad or other smart device without plug in wall , handy , conveniently and organized .Adjustable Alarm Sound and Snooze: Wake up to buzzer or radio should your preference. Both alarm source volume can be adjusted to your comfortable level . (buzzer : 3 level, radio: 1-15 level) . The alarm will begin sound faintly then increases to its max within 5 seconds. 8 minutes interval snooze can be repeated in one hour until turning off .